ST COLUMB'S College U14s clinched the Northern Ireland Schools Cup title after a magnificent victory over North West rivals, Holy Cross, Strabane in a one-side showpiece at the Ryan McBride Brandywell Stadium. It completed a hat-trick of N. Ireland Cup triumphs for this talented young side who now turn their attentions to the British Isles Championships in Belfast. 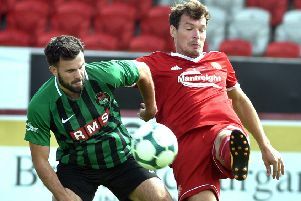 It was a ruthless display by the Derry school at the home of Derry City Football Club with Candy Stripes' boss Declan Devine and his assistant, Kevin Deery watching on from the Mark Farren Stand. Conor Barr and Jack McFeely both netted braces with 'goal machine' McFeely scoring in every single round of the competition, taking his personal tally to nine. Midfielder, Sean Carlin scored the pick of the six goals with a stunning free-kick in the first half while skipper, Oran Kelly also got on the scoresheet with a clinical finish. CHAMPIONS . . . St Columb's College U14s lift the Northern Ireland Schools Cup trophy at Brandywell. The Derry side couldn't have asked for a better start to the match as Shae Feeney raided down the left wing and his low cross found Barr who took a touch before dinking the ball over the keeper and into the net for a second minute lead. It was a confident start by the Buncrana Road school and the lively Feeney tried his luck from the edge of the penalty area with a decent strike which bounced in front of the Holy Cross goalmouth before going narrowly wide with the keeper scrambling towards his far post. And it wasn't long before the large College support witnessed a second goal as Evan McGilloway found McFeely and the in-form strike hit the crossbar with his first time effort and was first to react to the rebound with a clinical finish to fire St Columb's into a two goal lead. Holy Cross grew into the game and Josh Gallagher fired a shot across goal and wide from distance. Gallagher then sent a searching ball towards Daniel McAughrey who chested it into the path of Adam Duffy who sent his first time effort wide. The large support from St Columb's College and Holy Cross, Strabane during the Northern Ireland U14 Cup Final at the Ryan McBride Brandywell Stadium. 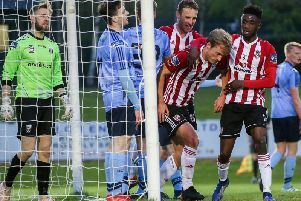 The Derry boys refused to take the foot off the pedal and McFeely was on hand to finish an excellent move as he found the corner of the net from close range. Carlin did brilliantly to dispossess Holy Cross midfielder, Robbie Conway before slotting the ball through to Barr and his strike needed to be parried away by the Holy Cross keeper on the half hour mark as the College turned the screw. Holy Cross couldn't get out of their own half and from a corner kick St Columb's kept the pressure on before it was laid back to skipper, Kelly who rifled into the net from 12 yards to make it 5-0. Paul Keogh was unfortunate his 40 yard free-kick didn't find the net as it rattled the crossbar with the Holy Cross keeper, Eoin Haire well beaten 12 minutes into the second half. Having kept St Columb's scoreless for 25 minutes of the second half it needed a fine solo effort from Barr who skilfully beat his man, made his way into the penalty area and squeezed his shot past the keeper at the near post. McFeely came so close to completing his hat-trick on 67 minutes when he was sent clean through in goal but his delicate lob from just inside the area nestled on the roof the net. It was a hugely impressive performance by St Columb's who have added the U14 trophy to their U12 and U13 titles in some style under manager, Ryan Horner. St Columb's College: Tiernan Morrison; Evan McGilloway, Oran Kelly, Peter Tracey, Callum McCarron; Lee Duddy, Sean Carlin, Paul Keogh, Shae Feeney; Conor Barr, Jack McFeely; Subs; Oisin Lynch, Cormac Kelly, Joshua Callaghan, Joseph McConnellogue. Holy Cross: Eoin Haire: Adam Patton, Cahir Grimley, Shea Collins, Oran Hunter; Joe Bishop, Josh Gallagher, Robbie Conway, Conal McGarrigle; Adam Duffy, Daniel McAughrey; Subs: Aiden Hegarty, Darragh Feeney, Finn McDermott, Rory Barclay, Mark Ellis, Kyle Crawford.